We are excited to announce the 2nd Annual PTPA scholarship. The Neilson award is given annually to those who help promote tennis on the peninsula. This year's recipient is Harvey Robinson. 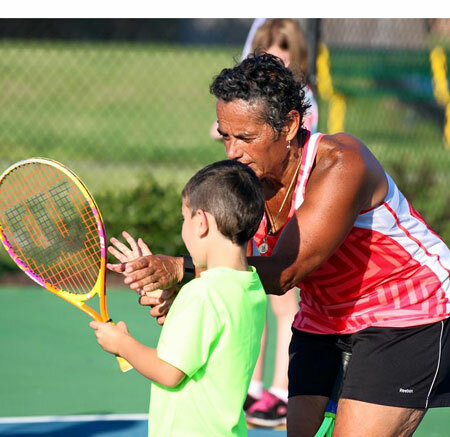 Harvey, a peninsula native, has been teaching tennis at Huntington Park and Achievable Dream for almost two decades. It's Back, and this time it's SOCIAL! 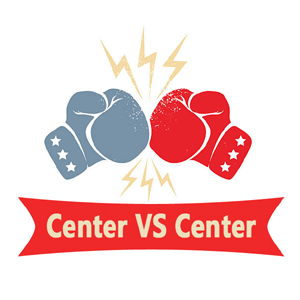 The Center vs Center is on! It will take place on Saturday, October 7th at Huntington Park Tennis Center 10am-8pm. Everyone is welcome to play regardless of level. All the Peninsula centers will have teams, so talk to your respective pro if you are interested in participating. The tournament has been rescheduled for the weekend of Sept 29th - Oct 1st. Congratulations to Walter Buck on winning the 2017 PTPA scholarship. It was a great weekend of tennis. Congratulations to the winners and thanks to our volunteers and everyone who participated. 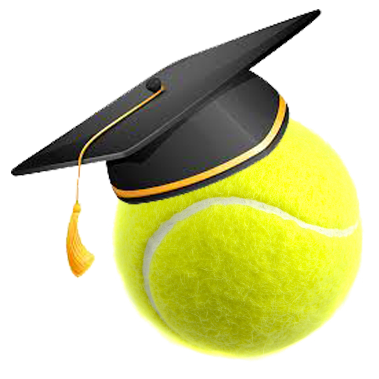 We are excited to announce the 1st Annual PTPA scholarship. Application deadline is June 1st, 2017. The annual meeting is Saturday January 21st, 4-6pm at Riverside. We will meet in Classroom A. Tell the folks at the front desk you are there for the PTPA meeting. It should last about 45 minutes. The Masters will be held at Riverside this year. Singles will be October 14-16th. Doubles the following weekend, October 21-23rd. Update: The dates have been moved forward a week. Singles are the weekend of the 14th and Doubles the 21st. This year, McCormack-Nagelsen Tennis Center has teamed up with other tennis facilities in the area to bring you opportunities for our juniors to gain experience playing a variety of different opponents from around the area while earning points for their "Team." Great turnout for the first Hampton Roads Junior Play Day at Huntington Park. Thanks to all the coaches and assistants. More pictures on the facebook page. The 2016 tournament schedule is posted. Registration is open for the Summer Sessions. Visit hratennis.com for more information and to signup for classes. For more information view the flyer and timeline. Congratulations to the winners and thanks to everyone who participated. The Neilson award is given annually to those who help promote tennis on the peninsula. 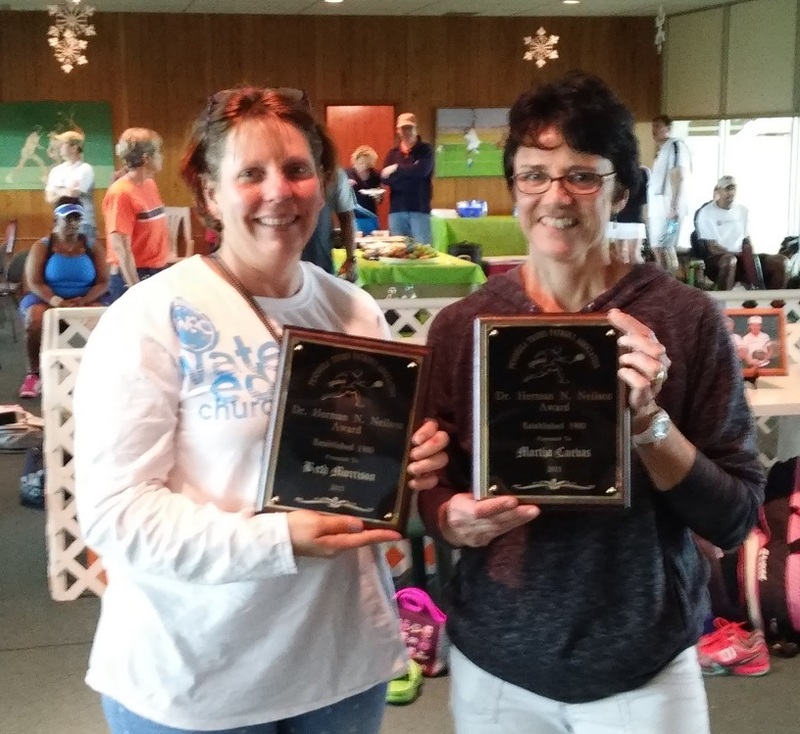 This year's recipients are Martha Cuevas and Beth Morrison who received the 2015 award for their work with 11 and Under kids tennis. The annual meeting will be held Saturday, March 12th at 1:30pm in the upstairs room at Centre Court. The meeting should last about 30 minutes. Everyone is invited. 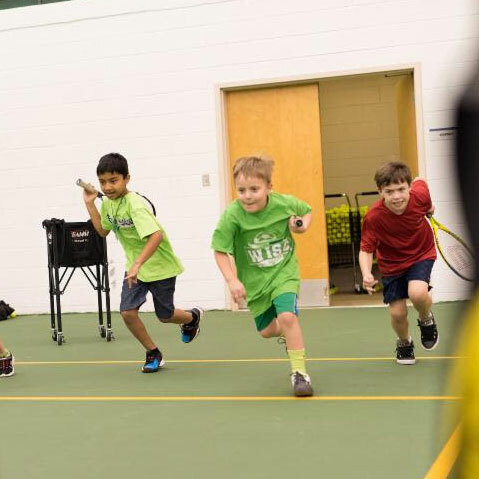 Want to help kids learn the game of tennis? A free coaches training clinic is available Feb 29th at Achievable Dream. The 2016 High School Kickoff is scheduled for Feb 26-28 at Centre Court. The date is set for The 2016 Don Watson Mixed Doubles Tournament. March 11-13, 2016 at Centre Court. $1000 check presentation to the American Heart Association. Left to Right: Skip Fox , Tournament Organizer; Amanda Linnertz, AHA Director of Development; Ned Haines, PTPA President. The second PTPA Briarfield Memorial Benefit Tennis Tournament was held August 15-17 at Bethel High School (the Briarfield Courts are under repair). The tournament is held in memory of Briarfield players who have passed away over the years; currently the number stands at fifteen.This year’s selected charity was the American Heart Association. Tournament Organizer, Skip Fox, secured several sponsors for the event, so even though the draw was fairly small, on September 4th the PTPA was able to present checks totaling $1000 to the AHA. 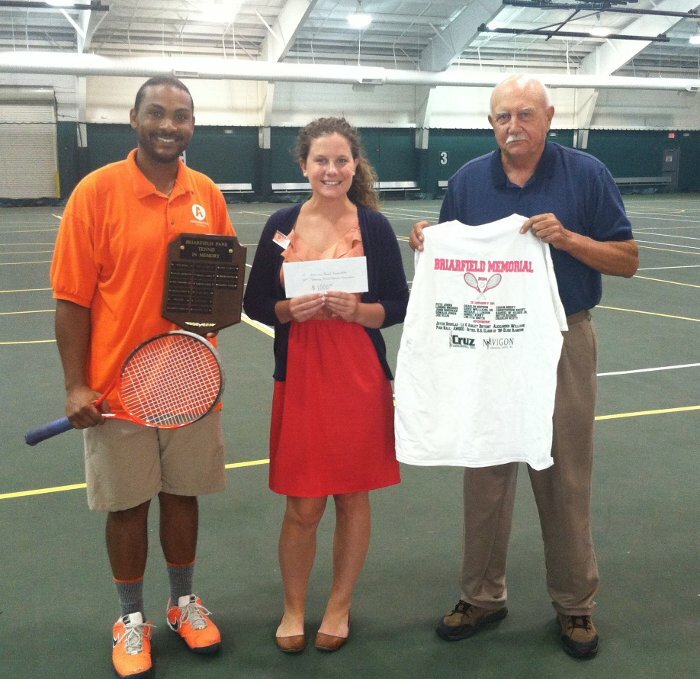 It is anticipated that the 2015 tournament will return to the Briarfield courts. The dates are set. Both events will be held at Centre Court in Newport News. This year's Back Creek Open has been cancelled because of weather. Dunk the Pro raised over $1,200. It is now scheduled for Sunday July 5th at 2:00 during the PTPA Fourth Of July Classic Tennis Tournament at Huntington Park Tennis Center. Mayor Price will dunk Kingsmill's Head Tennis Pro, Muri Ajibade while dressed in a pink skirt. Congratulations to this years winners and a big thanks to everyone who volunteered or participated. World Team Tennis Colonial Kickoff. 7 p.m. Friday, March 20 at William and Mary's McCormack-Nagelsen Tennis Center. Featuring co-ed teams competing in six sets -- men's singles, women's singles, men's doubles, women's doubles and two of mixed doubles. Entry fee: $20/player. Teams should consist of at least two men and two women, all rated between 3.0 and 4.0. This is a prelude to Colonial WTT leagues that start in April and will service the Peninsula. Please contact catherine@virginiatennis.com (Catherine DeSouza) for more information or to register a team. Visit virginiatennis.com for more. World Team Tennis Colonial leagues. Registration opens March 16 for Colonial spring leagues. 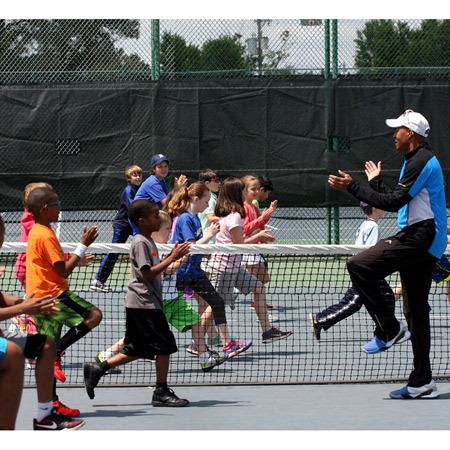 They can be formed at 3.0, 3.5, 4.0 and 4.5. contact catherine@virginiatennis.com or text 804-614-5526 for information. The 2015 High School Kickoff is scheduled for March 7-9th at Centre Court. View the flyer for more information. The date is set for the 2015 Don Watson Mixed Doubles Tournament, March 20 - 22 at Centre Court in Newport News. 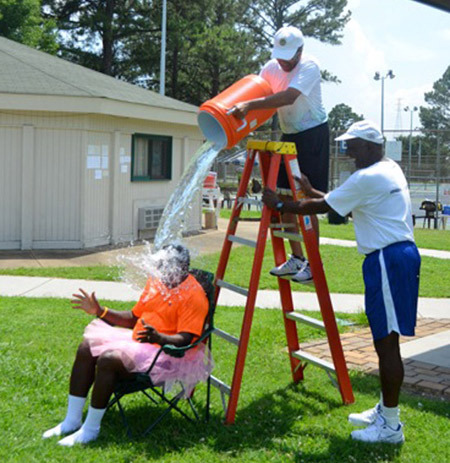 Vote for the Tennis Teaching Professional you most want to see dressed in a pink skirt being doused with water by Newport News Mayor, McKinley Price. Each vote costs $5. Vote as often as you like, and you can vote for more than one pro if you desire. The pro with the winning total will be doused with a bucket of water by Mayor Price. Deadline for voting is November 8th. The date and place for the dunking will be announced later. Ballots are available at any of the area's tennis facilities. Checks should be made payable to the American Cancer Society and are tax deductible. Participating pros include: Harvey Robinson, Brian Hogge, Russell Nevins, Bill Shivar, Jr., Muri Ajibade, Alex Vazquez, Rush Cole, Mike Prokopik, Brent Hughes, Donald Widner, Mark Hildenbrand, Steve Clark, & Eric Christiansen. The dates for the Masters have been set. Singles Nov 14-16, and the Doubles Nov 21-23, 2014. Both events will be held at Centre Court. Congratulations to everyone who competed in this years NTA Tournament. The location for the Briarfield Memorial Tournament has moved from Briarfield to Bethel High School. Congratulations to everyone who competed in this years Memorial Day Tournament. The date is set for the 2014 Don Watson Tournament: March 21 - 23, 2014 at Centre Court in Newport News. Because of the weather, the Octoberfest tournament has been moved to October 18-20. The new signup deadline is now the 16th. The Grand Prix Masters Singles will be November 15-17, 2013, and the Doubles the following week November 22-24, 2013. Both will be held at Centre Court in Newport News. The Briarfield tournament has been cancelled. Ned's letter to the Daily Press. Since rain has cancelled the past two Riverside singles tournaments, the scheduled doubles tournament will now include singles. The Riverside Summer Singles tournament has been canceled due to the weather. The Riverside Singles tournament has been postponed due to the weather. Congratulations to Menchville's boys tennis team. Read more here. The membership rates have changed. The Adult and Junior rates will remain the same. The Lifetime membership is now $300.00 and the Family membership has been lowered to only $20.00 a year. The tournament schedule is set. There are a record breaking 17 Grand Prix tournaments this year! Location: Centre Court Racquet Club, Newport News, VA.
Four main-draw divisions are planned: 10.0 , 9.0, 8.0, and 7.0. Each bracket will feature a drop-down tournament for teams that lose their first match (labeled at 9.5, 8.5, 7.5 and 6.5). The rating levels denote the combined levels of the two partners. The partners should not be more than one level different. You must play at or above your USTA level. The date for the 2013 Don Watson Memorial Doubles Tournament is March 15-17th at Centre Court in Newport News. More details will be posted soon. Congratulations to winners of the Grand Prix Masters doubles tournament. The meeting will start at 1:30pm Sunday December 16th at Centre Court in Newport News. Everyone is welcome. There will be refreshments and free open play from 2 - 4pm. Congratulations to winners of the Grand Prix Masters tournament. Men's 3.5: Joe Holloway Jr. The Grand Prix Masters tournaments will be held indoors at Centre Court this year. November 16-18 for the singles. December 14-16 for the doubles. The date for the Poquoson Open has changed to September 21-23, 2012. The 12th Annual Dr. Mary V. Bicouvaris Memorial Tennis Tournament will take place on April 23 at 4 p.m. at Centre Court in Newport News. The tournament will feature four players from Menchville's girls team. Senior Violet Hahn and freshman Racquel Rizzi will take on senior Claire Spencer and junior Maelyn Platon. The tournament schedule is set. There are 3 new tournaments this year, the Briarfield Memorial, Poquoson Open and the Perk Crain Open. The draws are available here. Online sign up will NOT be available for this tournament, Download the flyer here. 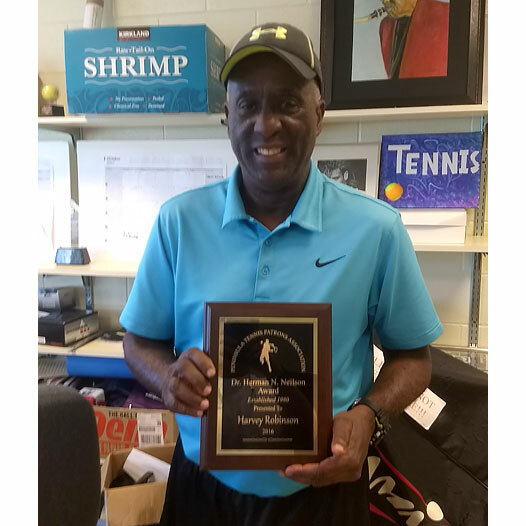 The Darryl Cummings top 40 Hampton Roads Tennis Rankings were developed using the Universal Tennis Rating System along with consulting with various tennis leaders/coaches within the area. To be on the list the player must reside in Hampton Roads. The rankings will be used to motivated play among top players, to promote the Cummings Tennis Showdowns, and to promote other local events. Please e-mail darryl@cummingsathletics.com to provide feedback on the current rankings or to recommend ranking changes or additions. 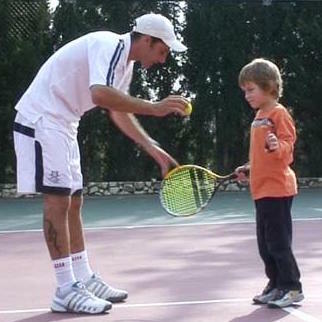 Note: UTR stands for Universal Tennis Rating (www.universaltennisrating.com). Currently the #6 player on the UVA Men’s Team has a UTR of 12.92. Currently the #6 player on the Stanford Women’s Team has a UTR of 10.54. The annual PTPA meeting will be held at Centre Court on Friday December 16th at 7:30pm. Check the flyer for more information. The doubles events have been rescheduled due to rain. They will take place September 24-25 at the Hampton Tennis Center. If you registered previously, please register again. All the matches scheduled for Saturday have been cancelled. Play will resume Sunday using Saturday's match times. The Grand Prix rankings have been updated through the end of August. The final standings in the Men's 4.0 round robin were: Jay Wendell - Joe Baust 3-0, Ravi Khandpur - Tony Bevilaqua 2-1, Joe Holloway - Kwmane Tonkins 1-2, Ron Morrison - Todd Wolmoe 0-3. In the Mixed 4.0 round robin, the team of Steve Whetstine and Mary Neale finished first with a record of 2-1. Airen Loth won the 4.5 Men's division defeating Chris Cruz. Travis Cruz beat his brother Tyler Cruz to take the 4.0 title. Howard Clayton won the 3.5 division. Leslie Siman-Tov won the Women's 4.0, and Carmen Grady won the 3.5. In Doubles, Airen Loth and William Knight won the Men's 4.5. Ravi Khandpur and Ankit Gupta took the Men's 4.0 title. The Women's 4.0 doubles went to the team of Marsha Davis and Kathy Kretz. Airen Loth defated Chris Cruz 7-6, 6-3 to take the Men's 4.5 title. Travis Cruz won the Men's 4.0 division beating Tyler Cruz 6-2, 6-2. In the 3.5 group, Dillon Dodson defeated Robert Wood 6-3, 6-0. Adrienne Rylander grabbed the Women's 4.0 title after Patty Kalabsa retired due to an injury. In the 3.5 division, Jackie Lageschulte won over Kendall Crump 8-1. The Grand Prix rankings have been updated through the Riverside Singles tournament on June 12th. Eric Christiansen won the Open division beating Jason Dunn 6-2, 6-4. In the Men's 4.5, Mike Anderson defeated Mark Hildenbrand 6-3, 6-2. David Williams won the Men's 4.0 over Mike Tenn 6-3, 6-2. The Men's 3.5 title went to Stuart McCroskey who defeated Joe Coccimiglio 6-0, 6-1. On the Women's side, Sheila Jett took the 3.5 title defeating Kendall Crump 4-6, 6-2, 6-2. The Men's 4.5 Doubles the team of Ed Kahn and David Loope defeated Floyd Pettaway and Mike Tenn 6-4, 6-4. While in Mixed Doubles, Tomasz Plawski and Wiktoria Plawski won the 4.0 division beating Beata Plawska and Mike Rampmeyer 6-3, 6-4. Mark Hildenbrand won the men's 4.5 division defeating Chris Yost 7-5, 6-1. Alex Howlett won the men's 4.0, and the men's 3.5 title went to Christopher Jerry. On the women's side, Leslie Siman-Tov won the 4.0, and Gavi Siman-Tov won the 3.5 division. In doubles, Airein Loth and Greg Sherman defeated Scott Vaneck and Dustan DeMello in a tight match 7-5, 3-6, 6-4 to take the men's 4.5/4.0 title. Bill Dressler and Leon Adams won the men's 3.5. Martha Cuevas and Angela Woldmoe won the women's doubles. The 4.5/4.0 mixed doubles title went to Valerie Jones and Eddie Thorton, while the 3.5 division was won by Memi Taylor and Mike Tenn.
View the full draws and pictures from the tournament. Mike Anderson defeated Tim Yoder 3-6, 6-2, 6-3 to take the Men's 4.5 title. While in the 4.0 back draw, George Liakos won beating Mike Ryon 2-6, 6-4, 7-5. The Tidewater area USTA is looking for Captains at all levels for 2011 Adult, Mixed, and Senior USTA League play. If you are interested in being a captain or maybe participating in a USTA league, contact the local league coordinator Michelle Brady. You can email her, call/text her at 747-846-4498, or visit the Tidewater Area Leagues Facebook page. Congratulations to all the winners of the Don Watson Doubles, and thanks to all the players and volunteers who helped make the tournament such a success. View the draws and pictures from the event. The draws for the Don Watson are available online here. We are going to try and keep these updated throughout the tournament. Marvin Hedgepeth and Jack Thompson were the Men's 55 Doubles runner-ups at the 2011 PTR International Championships. Jack along with his partner Linda McCollum clenched the mixed title. The 11th Annual Dr. Mary V. Bicouvaris Memorial Tennis Tournament will take place on March 10 at 4 p.m. at Centre Court in Newport News. The tournament will feature two players from Menchville High School's girls' team. Location: McCormack Nagelson Tennis Center, Williamsburg. Four main-draw divisions are planned: the Championship bracket, 9.0 and below, 8.0 and below, and 7.0 and below. The entry deadline is March 8th. Draws will be limited. Order of receipt of entry, with payment, will determine order of acceptance. After a long period of hibernation, the website is back. If you have any news or events that you would like to see published here, drop us an email.